This activity was developed to allow open ended learning for our children in exploring the four operations of maths - with a familiar twist! 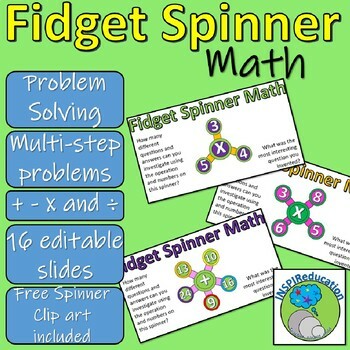 We have designed a series of fidget spinners (of which you also receive the clipart as part of this resource) which are used to present this problem solving activity. As with all fidget spinners, their designs are different, with a central circle and outer arms with further circles on the end. We have used this design to place numbers and symbols in the centre and at the end of the fidget spinners. The aim of the activity is for the children to invent and solve the most interesting questions using the numbers and operations given. This activity can be fully differentiated as some spinners have only one arm all the way up to ten arms. This means that the math can become incredibly complicated, particularly when spinners are combined together. You can see a selection of slides in the preview to see the quality of the product before you choose to purchase. All of the slides can be downloaded upon purchase and used immediately. The resource includes 16 pre-made slides, but all of them can be edited by the class teacher quickly and easily. If further slides are required, the clip art included can be used to further extend this activity. 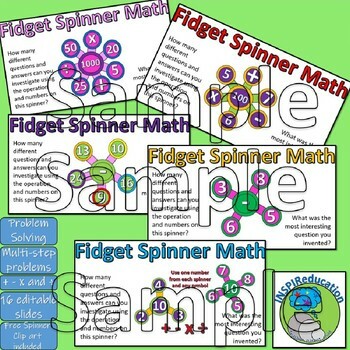 These slides can also be printed off and used as a Math Center activity. Not only that, but they can be sent home for home learning. Our children love this activity - not just because of the open ended problem solving - of which they set themselves some very tricky questions within the four operations, but because they love the Fidget Spinner presentation of the activity. We hope that your children will love this activity too. Thank you for viewing our store.